Discover God's Infinite Mercy with us this summer! 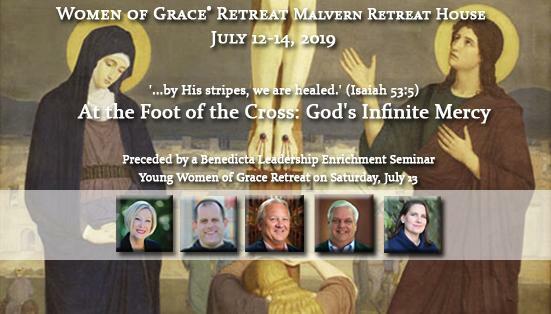 The Women of Grace Retreat at Malvern Retreat House with Johnnette Benkovic Williams, Fr. Nathan Cromly, Dr. Carrie Gress and more! 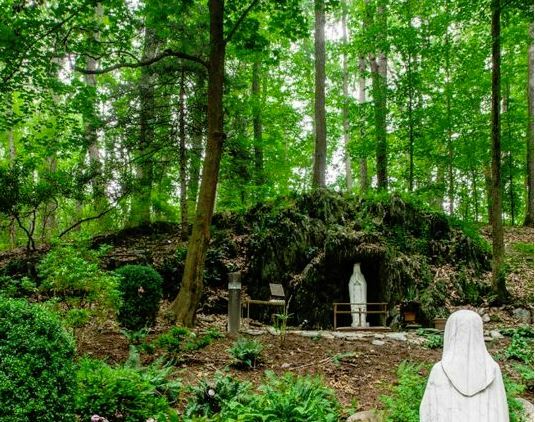 "Catholic Women's Leadership and the Power of the Holy Spirit and His Gifts"
"Dare to Prepare for True Friendship"
Click image to see previous retreat pictures! Father Nathan Cromly is an informative and engaging speaker, writer, retreat leader, explorer, innovator, educator, and fire-starter for the Lord. Born and raised in Toledo, Ohio, he has joyfully served as a Catholic priest of the Brothers of Saint John for 11 years, and currently ministers in Denver, Colorado. Father Nathan’s spiritual direction, teaching, and dynamic witness have touched the lives of tens of thousands of children, teenagers, married couples, business professionals, and families. Father Nathan’s ministry has flourished by God’s grace. He began Eagle Eye Ministries in 2003; it is now home to six forms of outreach to teens and young adults. In 2015, he opened the Saint John Institute (SJI) —a unique program in which young adults earn an accredited Masters degree while receiving spiritual formation from the Brothers of Saint John. In the Spring of 2018, SJI celebrated its first graduating class, sending its graduates to work for the Lord in the for-profit world. Inspiring and equipping great talent for the Lord’s harvest, Eagle Eye Ministries and the Saint John Institute serve to raise up the spirit of the new evangelization in young people and send missionary entrepreneurs into the Church. Dr. Carrie Gress has a doctorate in philosophy from the Catholic University of America. She is the editor at Helena Daily, a faculty member at Pontifex University and a member of the International Marian Association. Carrie is a regular blogger at The National Catholic Register and has written for numerous publications, including Aleteia, Catholic Vote, Catholic World Report, The Catholic Thing, The Federalist, and The Stream. She is a regular guest on Catholic Answers and is frequently on Ave Maria Radio, EWTN Radio, and Relevant Radio, and has appeared on BBC, CBC, EWTN and Shalom World television. Carrie has lived and worked professionally in Washington, D.C. and Rome, Italy and her work has been translated into nine languages. She is the author of Nudging Conversions (Dynamic Catholic 2015), Ultimate Makeover (Dynamic Catholic, 2016), The Marian Option (TAN Books, 2017), and Marian Consecration for Children (TAN Books, 2018). She co-authored City of Saints; A Pilgrim’s Guide to John Paul II’s Krakow with George Weigel. Her latest book, The Anti-Mary Exposed (TAN Books) was released in March 1, 2019. Click here to view tentative schedules .